The current ELTchat Blog Challenge is to share with us your first lesson plan. If you can’t find it or threw it away in a tidy up many moons ago, then why not tell us about your first ever lesson as an EFL teacher? What do you remember? What do you wish you’d known then that you know now? And when you look back on that lesson, how do you trace your own development since that day? I’d love to hear about your memories and reflections. If you’d like to learn more, listen to Bethany Cagnol’s reflections on the ELTchat podcast. I’ve actually already blogged about my first ever lesson, in fact it was my first post proper on this blog back in October 2010. For this post I have decided to literally write about my first lesson plan, the first time I ever sat down and wrote out my aims and the procedure of the class in a formal way. Not surprisingly, this was on my CELTA. Twenty minutes! Oh how I remember it now, it seemed like an eternity. Now it disappears in a heartbeat. But it’s hard to achieve a lot in that amount of time, so it does make a difference in how I assess the plan. Clearly this was a writing class with the idea of recycling vocabulary already learned in the lesson (the lesson was divided up into sections, twenty minutes per teacher). I have no problem with that! – Eight points in twenty minutes! For me, that’s overplanning but at the time I needed to break a lesson down, understand its constituant parts and how they work in order for them to become the second nature that they are now. – I used a supermodel as an example, which I certainly wouldn’t do now. It’s too bland and clichéd for me nowadays. Politician could certainly create some interesting feelings in most countries at the moment, and then we’d use students own examples rather than mine. – As activities go, it’s not a bad one. I wouldn’t make handouts now, just give them pieces of paper which they could divide up into four. – I collected examples of errors but didn’t mention also collecting positive, correct uses of the target language which I would always do now. – It didn’t coalesce into a more meaningful activity, but I didn’t have time, so I’ll let myself off that one. I should have played a less active role in point four. Now I would let the students get on with it without my input unless they specific asked for something. Otherwise, I would monitor, take notes, and not get involved. 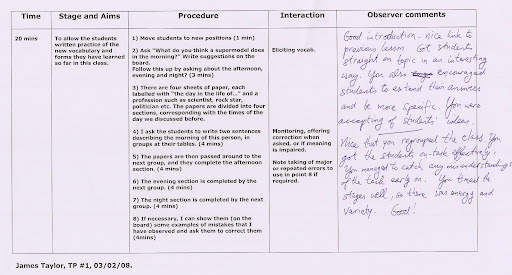 The feedback was very positive, but this examiner was known as the good cop of our two trainers! I’m sure he overlooked numerous faults in order to look to the positive, especially as it was the first teaching practice of the course. I particularly remember the feedback I received after this session as it was one of those occasions where somebody says something that really sticks in your mind. In general, I’m a fairly lighthearted person so I was surprised when one of my fellow trainees described me as coming across as very serious in the lesson. She basically told me to smile more, and that simple point was very helpful in opening me up to the students and has helped me a great deal over the years. Thanks Lindsay! Join the ELTchat Blog Challenge! Write about your first lesson plan or your earliest teaching memory on your blog and share it with me in the comments below, or tweet it with the hashtag #eltchat. For more details, read here. Such a nice reflection, James, loved it! You'll have to give me a while. I've got twelve years of gap fill exercises to wade through. Thanks Marisa, much appreciated. And Adam, I'll wait! Thanks for sharing this, James… I enjoyed it very much. Thanks Sue, I'd love to find out what's in that old CELTA file! Any luck finding it yet? Ah c'mon Tyson! Of course reflecting on last year is more practical, but you should treat this as a more philosophical exercise with a bit of nostalgia thrown in for good measure. If you could say only 5 words to that Tyson 14 years ago, what would you say? Still looking, although I have an idea where it might be. “You will get better.” – There… 4 words! I reflected on my first day teaching at a hagwon in Korea – pre-Celta – to camera. No lesson plan. Just 'wing it'. Enjoy! 1 Oct 2007. Have scanned my first Celta lesson plan but need an idea on how to share it on here. Thanks Phil, and don't worry, I'm in this for the long game so a year to wait is fine! I really enjoyed your video, especially as I taught in Korea too, so it was tinged with nostalgia for me. Looking forward to seeing your first lesson plan, I wonder how you feel about it now.